Large and assertive fish with big appetites, snappers can be quite a challenge to keep in the aquarium. Some species, like black beauties and Mangrove Jacks, should probably be avoided altogether, but others can get along well if you give them the right kind of care. They're naturally hardy and can live for decades. Like most carnivores, they're quite intelligent and will take an interest in the world outside their aquarium. Because snappers are such big fish they need a lot of room. Make sure that when you're tempted by an impressive looking juvenile you check just how big it can get. Most snappers are happiest living alone or with fish of other species. Snappers are highly adaptable when it comes to salt levels and can live in anything from brackish to full marine aquaria, though they prefer higher salt levels. You should be careful to let them adapt slowly when moving between tanks. They're highly resistant to disease and can be treated with standard aquarium medicines. They will be more confident if their environment includes rock or coral caves to hide in. Often snappers refuse to eat for a few days after being introduced to a new home. This is normal and should not be cause for panic. They may also refuse food at other stressful times, but rarely for very long. In general you will have more trouble stopping them from eating things. Snappers are happiest with live food but can usually be trained to eat chunks of fish or seafood bought from a supermarket. They can be very enthusiastic and have a powerful bite, so watch your fingers when feeding, especially as they get bigger. Some may also attack corals and ornaments in the aquarium. Despite their reputation for aggression, most snappers get along well with other suitably large fish.. Avoid keeping them with crustaceans of any size, since they are always likely to see these first and foremost as food. Tankmates will need to be reasonably assertive in order to successfully compete with your snappers for food. A tank with plenty of hiding places will reduce the risk of conflicts. Each different species of snapper has its own unique needs, so think carefully before making your selection if you want to find the right fish for your aquarium set-up. Emperor Snappers - Extraordinary beauties even among tropical fish, these elegant striped creatures are tough and adaptable but grow up to a metre in length, so don't be tempted unless you have a really large tank. Sadly their colours fade as they grow. 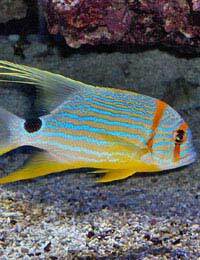 Eight Stripe Snappers - These handsome yellow fish get brighter with age and grow to a more manageable thirty five centimetres, but they are happiest in shoals with others of their kind, so you'll still need a spacious aquarium. Chequered Snappers - These gorgeous black and silver fish, chequered on the top half and stripy on the bottom, grow to about thirty five centimetres. They can be shy but usually develop into friendly, active community members over time. Sailfin Snappers - These magnificent looking fish rarely exceed forty centimetres in captivity and are one of the best snapper choices for the aquarium. They should be kept with peaceful species as their long, trailing fins can attract bullying. Schoolmaster Snappers - These bronze-coloured fish are among the more aggressive snappers and can grow up to sixty centimetres long but make rewarding pets for patient, attentive owners. They prefer brackish water. Whatever species of snapper you choose, remember that you're making a long term commitment. What you'll get in return is a fish with seemingly boundless energy and lots of personality.